Who said the Holidays Have to be Stressful? Wouldn’t it be nice to mark Everyone off of your list in One Stop? Come into The Fur Traders, to get the Luxurious Gifts your Family Deserves. 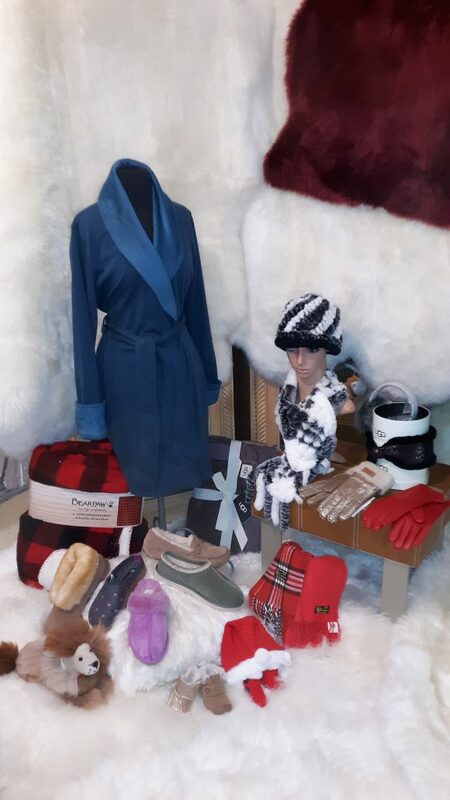 Choose from the Largest UGG Selection in Northern California to make a combo Gift Set of Sheepskin Slippers Paired with a Cozy Robe, or a Pajama and Sock Combo set. Keep Everyone Warm, and Cute, with Matching Glove and Scarf sets, Made with only the Highest Quality Rabbit, Alpaca, Fox, Wool, And Cashmere. Give a Treat to go On the Feet by Picking through the Largest Selection of Sheepskin Footwear including Slippers, Top-Quality, Moccasins, for Men and Women from Baby to Big-foot! Give the Gift of Supreme Warmth and Coziness with Alpaca Sweaters, Wool Ponchos, Leather Jackets, or FurCoats. Get Unique Gifts for Everyone on your Nice List this Year! Found at 303 Broad Street in Historic Nevada City. Open Seven days a week 10-6 with Extended Holiday hours 10-9 Friday and Saturday. PSSST…and be sure to Catch our Warehouse Sales at 10181 Commercial Avenue in Penn Valley, with Deals all the way up to 60% OFF! Every Friday, Saturday, and Sunday 10am-6pm the whole month of December.